One of the most important things we can teach our kids is kindness. Kindness can be shown by small, spontaneous gestures that are thoughtful, helpful, and caring – done without expectation of anything in return. Acts of kindness are simple to do, yet it’s easy to miss the opportunities to show kindness that are all around us, if we’re not looking for them. Kids can develop a habit of kindness by brainstorming kind things they would like to do more often on a “Paper Chain of Kindness” to help them remember. They could start with some simple ideas like those below, and add more as they think of them. Remember that kids learn best when they see us doing the things we talk with them about! 1. Listen – When someone is talking to you, instead of thinking about what you’ll say in response, try really listening to them. 2. Hold doors open – Make it a habit to hold doors open whenever you have the chance, even racing ahead if necessary to be the one to open the door. 3. Smile – Eye contact and a genuine smile can brighten someone’s day more than you might think. 4. Say “Please”, “Thank you”, and “Excuse me” – No explanation needed here! 5. Give sincere compliments – Be on the lookout for things to compliment or praise in others. Have kids write their ideas on paper loops or circles made with this fun circle punch. This 1/8″ punch is helpful for connecting the circles. Then join them into a chain to hang where they’ll see them every day as a reminder. 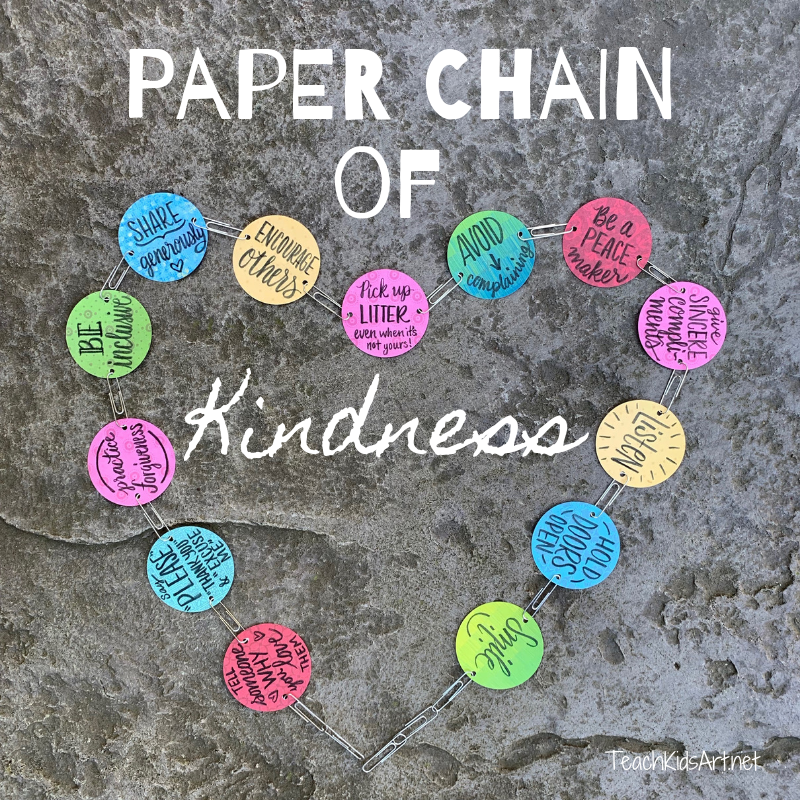 February’s #CMACIVICKIDS Digital Challenge is “Paper Chain of Kindness”. Try my project (above), CMA’s project (here), or make a “Paper Chain of Kindness” with your own unique twist. Have your project added to CMA’s online exhibition by sharing it on Instagram, Facebook, or Twitter using the hashtags #CMACIVICKIDS and #TeachKidsArt. Affiliate links are used in this post. I earn a small commission when you visit Amazon.com by clicking through my site and making a purchase of any kind. This supports Teach Kids Art at no extra cost to you.